Tomas Vavricek und Pavel Karafiat sind zwei junge tschechische Künstler, die mit ortsbezogenen Installationen arbeiten und dabei hauptsächlich das Medium Licht benutzen. Am 13. und 14. Juni wird das Duo mit ihren drei Installationen Leben auf die Fassaden der Höfe von Haus Schwarzenberg bringen. Die erste Installation wird durch Animationen die dicht bemalten Graffitiwände des Eingangs in bewegte Bilder verwandeln. Die bereits vorhandenen Graffitis und Charaktere auf den Fassaden werden per Animation zum Leben erweckt und beginnen untereinander zu kommunizieren. In einer zweiten Projektion, auf die Decke des Eingangsbereiches und im Hof, zeigen die beiden Künstler einen Ausschnitt ihrer Arbeiten, die bereits international präsentiert wurden. Der Eingang zum Haus Schwarzenberg wird vibrieren mit Bildern, die der Besucher sehen und erleben kann. In einer dritten Lichtinstallation projiziert das Duo live auf eine der Fassaden im Hof und schafft durch alle Installationen zusammen eine besondere visuelle Erfahrung, nur für diesen Ort entwickelt. Diese ortsbezogene Lichtinstallation wurde produziert und kuratiert von Petr Hájek/The Chemistry Gallery und dem in Prag ansässigen Künstler Robert Carrithers. Mit freundlicher Unterstützung durch das Tschechische Zentrum in Berlin. Tomas Vavricek and Pavel Karafiat are two young Czech visual artists that create site specific installations and are working mostly with the medium of light. On June 13th and 14th they will create three specific light installations in Haus Schwarzenberg - in the heart/center of Berlin. The first light installation will change the densely painted graffiti walls of the entrance into moving visuals through animation. The projections will make use of the existing paintings on the walls. Through the artist's animation, the various graffiti characters on the walls will come alive with movement and will communicate with each other. Some of the characters will have a dialogue with each other through comic bubbles. The second installation will consist of some of the work of the artists that have been internationally presented in various countries. These visuals will be projected on the ceiling of the entrance and in the courtyard. The entrance will vibrate with images that the visitors can see and experience. The third light installation will be projected live by both artists on one of the walls of the courtyard. This will all culminate with a very special visual experience created specifically for this outdoor space. 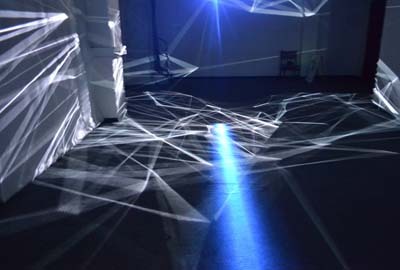 This visual site specific light installation is produced and curated by Petr Hájek/The Chemistry Gallery and the Prague based artist Robert Carrithers and supported from the Tschechisches Zentrum in Berlin.